Hong Kong is preparing to launch a real-time retail payment service in September, the head of the city’s de facto central bank said. The service, officially called Faster Payment System (FPS) and currently in use in the U.K., enables real-time or near-real-time retail payments, settlement and fund transfers between banks and nonbanks. Nonbanks include third-party payment-service providers that have secured licenses to offer prepaid services, such as Alipay and WeChat Pay. “Whatever payment method adopted by the merchants, you can transfer money through banks or other nonbank payment accounts without barriers,” Norman Chan, chief executive of the Hong Kong Monetary Authority (HKMA), told reporters in Beijing recently. “The only thing you need to do is to log in the system with a phone number or email address,” Chan added. The HKMA is also leading a group that is working on common QR-code standards for retail payments. Such standards hopefully will help expand the cashless system to more merchants, particularly small shops and businesses, Chan said. There have been increasing calls for Hong Kong to step up creation of a cashless-payment system, especially since mainland Chinese players are expanding aggressively in the field. Alipay said in September it will set up a joint venture with Hong Kong billionaire Li Ka-shing’s CK Hutchison Holdings Ltd. to expand its reach in the former British colony. 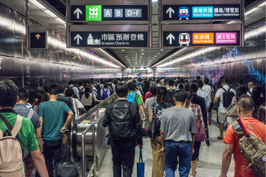 Meanwhile, both Alipay and WeChat Pay said they will soon be accepted by Hong Kong’s subway system. Since August, the HKMA has granted stored-value service provider licenses to 13 third-party payment providers. 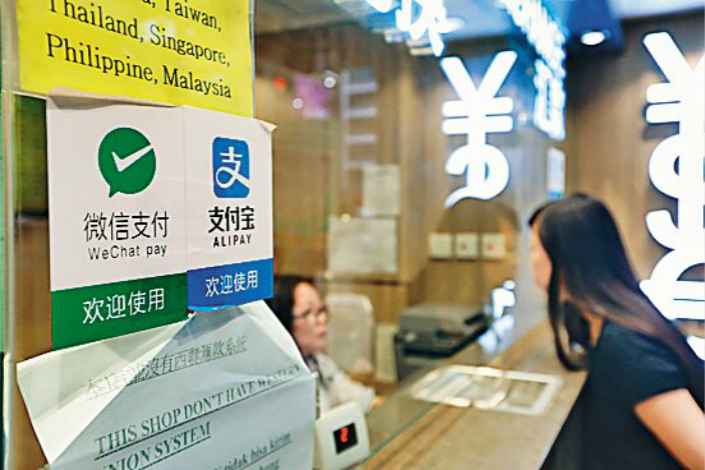 On mainland China, licensee Tencent Holdings Co.’s WeChat Pay and Ant Financial Services Group’s Alipay account for more than 90% of nonbank online payment market. Before the entrance of mainland Chinese players, Hong Kong’s payment market was long dominated by credit cards and the Octopus Card, a stored-value electronic payment card introduced in 1997. As of the end of June, more than three-quarters of the 43.5 million nonbank stored-value cards used in Hong Kong were Octopus Cards, according to data from the HKMA. In a speech in September, the HKMA’s Chan promoted the FPS as the top of the seven initiatives to move Hong Kong toward a smart-banking era, suggesting that the platform will provide the necessary infrastructure for full connectivity not only among retail customers but also between businesses and between banks and nonbank payment-service providers.